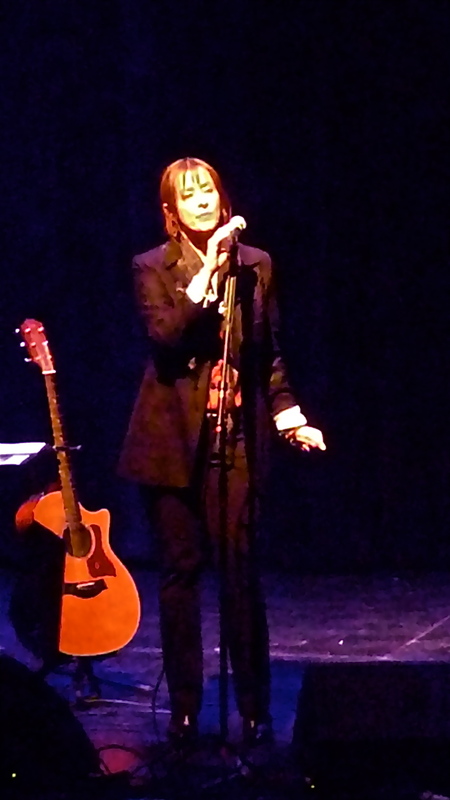 After so many years, we finally decided to see Suzanne Vega play live, at the Palace of Fine Arts, San Francisco. Though I have been a fan of her brilliant poetry and soft folk whisper on record for years, the few live broadcasts I saw of her seemed lacking in personality. Apparently these were poor showings because at the palace last month Suzanne was funny, engaging and of very strong voice in her delivery of old and new work. She is touring to support a series of re-recordings of her best melodies over the years, now out on her own label, and coming in four parts beginning with Close Up, Vol. 1, Love Songs. Many of the highlights of the set were tracks from her first two releases, with standouts including Calypso, Gypsy, and The Queen and the Soldier bringing thunderous applause. The creative backing duo original bassist Mike Visceglia and guitar wizard Gerry Leonard added a bit of fusion and psychedelia into the mix improving the arrangements far beyond the studio originals. New tracks were equally resonant and even dramatic, coming from work Suzanne is doing for the stage this spring. Now very much a fan of both her studio and her live work. Fine art at the palace – yes.